JESSICA’s custom nail colours evoke the rebel in you! Introducing Rebel Glam, an assortment of six intense colours designed with a rebellious heart and sophisticated mind. Rebel Glam takes you for a walk on the wild side with eye-popping purples, vampy red, mysterious black and captivating green. The Rebel Glam collection will be available beginning in September 2011 and each colour retails for $7.50 at JESSICA Cosmetics and spas. 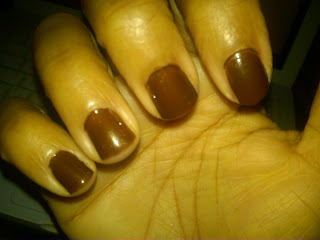 ... And 'though I am very much a purple nail polish girl, I love this chocolate brown "Wild Thing"